I will also reveal my goals for the year 2015. The idea behind this is that when I write my goals down, I am more likely to achieve them. I “borrowed” this format from Chris Guillebeau. If you want write your own annual review, you should read this blog post. It might give you some useful ideas. I wrote 48 new blog posts in 2014 and rewrote at least three old blog posts. This means that I wrote almost one blog post a week. Getting Started with Gradle (4 new blog posts) will help you to get started with Gradle by solving real world problems one problem at a time. Using jOOQ with Spring (4 new blog posts) will help you to get back in control of your SQL (you will learn to use jOOQ as well). Spring Data JPA Tutorial (3 new blog posts) will help you to implement JPA repositories without any boilerplate code. Writing Clean Tests (8 new blog posts) describes why you should make your tests as clean as possible. It also provides practical tips that help you transform your test cases into executable specifications. Writing Tests for Data Access Code (5 new blog posts) helps you to write deterministic data access tests that test the right thing, are easy to read, and easy to maintain. I think that I had a pretty productive year. I didn’t record any new videos. I was supposed to record at least a few new videos and publish them on my Youtube channel, but I didn’t record anything because “I didn’t have time to do it”. I didn’t even start writing my Spring testing book. I started coding the first example application but the amount of required work seemed overwhelming and I never finished it. There are probably a few smaller things that I should have done, but these two things are the things that I regret the most. Before I reveal my goals for the year 2015, let’s take a quick at the statistics that I gathered in 2014. Vanity metrics are things like registered users, downloads, and raw pageviews. They are easily manipulated, and do not necessarily correlate to the numbers that really matter: active users, engagement, the cost of getting new customers, and ultimately revenues and profits. The latter are more actionable metrics. Publishing these statistics makes me feel good. I wanted to show what kind of traffic you can get without having an email list or a “real” content marketing strategy. Let’s move and find out what kind of traffic my blog got in 2014. My blog had 38043 visitors in December 2013. My blog had 84794 visitors in December 2014. I doubled the number of visitors my blog gets in a month. 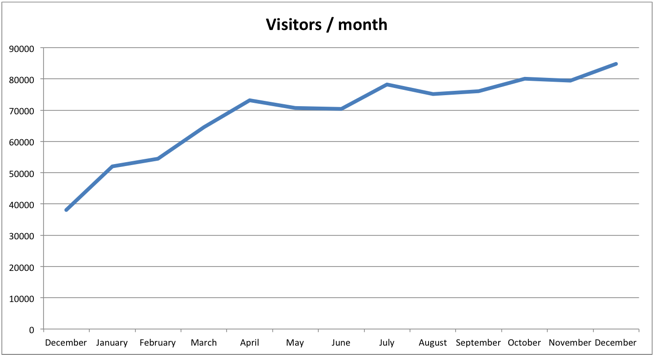 If you want see how my monthly visitor count evolved in 2014, you should take a look at the following figure. My blog had 22819 unique visitors in December 2013. My blog had 54068 unique visitors in December 2014. I doubled the number of unique visitors my blog gets in a month. 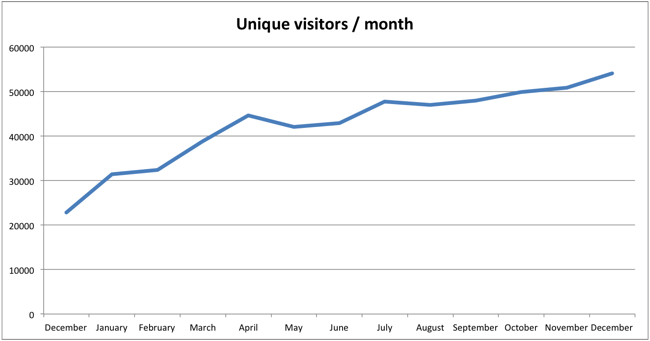 The following figure illustrates how the number of unique visitors evolved in 2014. My blog had 62100 page views in December 2013. My blog had 129893 page views in December 2014. I doubled the number of monthly page views. 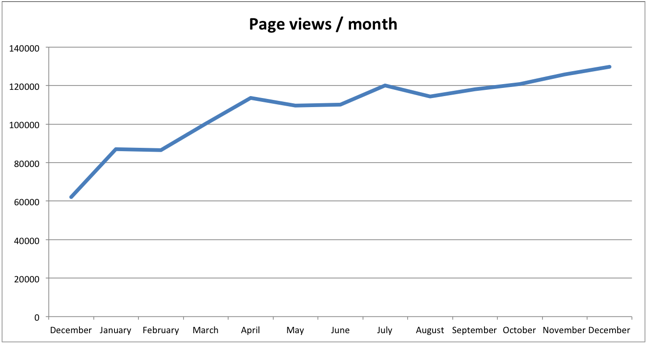 If you want know how the number of monthly page views evolved in 2014, you should take look at the following figure. As you can see, Google sends me most of my traffic, but I am a bit surprised that so many people came straight to my blog. Anyway, the following figure demonstrates how the big G dominated my other traffic sources. It is no surprise to me that United States and India dominate this “category”. However, I am happy to see that I got a lot of visitors from other countries as well (I got visitors from 207 different countries). The following figure “proves” that my website really got traffic from all around the world. Enough with vanity metrics. It is time to reveal my goals for the year 2015! Update my Spring Data JPA tutorial. Update my Spring MVC Test tutorial (I will transform these blog posts into a book later). Finish my Using jOOQ with Spring tutorial. Write more blog posts about Gradle and Spring Social. Record 5 videos and upload them to Youtube. Create an email “newsletter” that has 300 subscribers. I think that these goals are pretty realistic, and I should be able to exceed some of them (and achieve the rest). Thank you for reading my blog. Happy new year! For your goal of creating youtube videos, I see that as at today you haven’t done it. May I suggest start with something really simple to get into the habit? For example: you could do a 2-minute book review of a recent book that you read. I think your followers (including me) will appreciate seeing you on camera! Then later, you can start the long form videos that you did long ago. As you are a published author, I think a regular presence of another channel (i.e youtube) could serve well to increase your brand awareness! For your goal of creating youtube videos, I see that as at today you haven’t done it. May I suggest start with something really simple to get into the habit? For example: you could do a 2-minute book review of a recent book that you read. I haven’t recorded new videos because recording those videos took too long. I agree that I should probably record shorter videos that don’t have a manuscript. This way I could record them much faster and they would probably feel a bit more natural than my older videos.